Salads are labeled as side dishes when they could just as easily become the hero. A marrying of fresh flavors and varying textures, salads are a welcome relief from standard fare. For a larger meal, serve with grilled chicken breast or a chunk of grilled ciabatta bread. Oleoestepa Arbequina is fruity in taste, most characterized by green fruits, tomatoes and hint of green almond. With a balancing of peppery arugula and fresh oranges, the olive oil sings. Place all dressing ingredients into a tall bowl or glass. Mix with an immersion blender until very smooth. Set aside. Place arugula into a large serving bowl. Using a peeler, shave the asparagus over the arugula, starting at the tips and working down. Discard the hard ends. 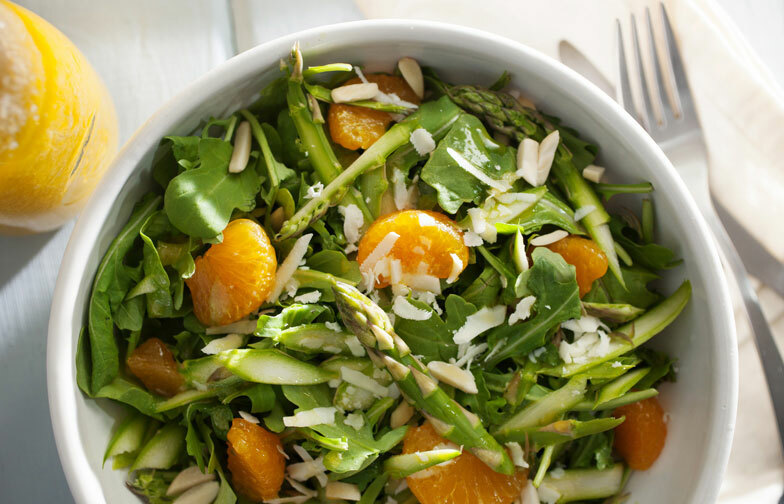 Top with orange slices, almonds, Parmesan and dressing then toss. Serve immediately.